Auburn has some terrific public art and today I braved the cold rain to capture two of the best. The delightful piece is called “Gear Ball” and it is by Jenny Ellsworth. It is made of truck parts and is part of the Auburn Downtown Sculpture Gallery. Greg Bartol and Deborah Drllevich’s Silverware Ostrich earned the People’s Choice award in 2015. It is a great piece from a car drive by, but I’m so glad I got out of the car to really take a look at it. It is made out of silverware! 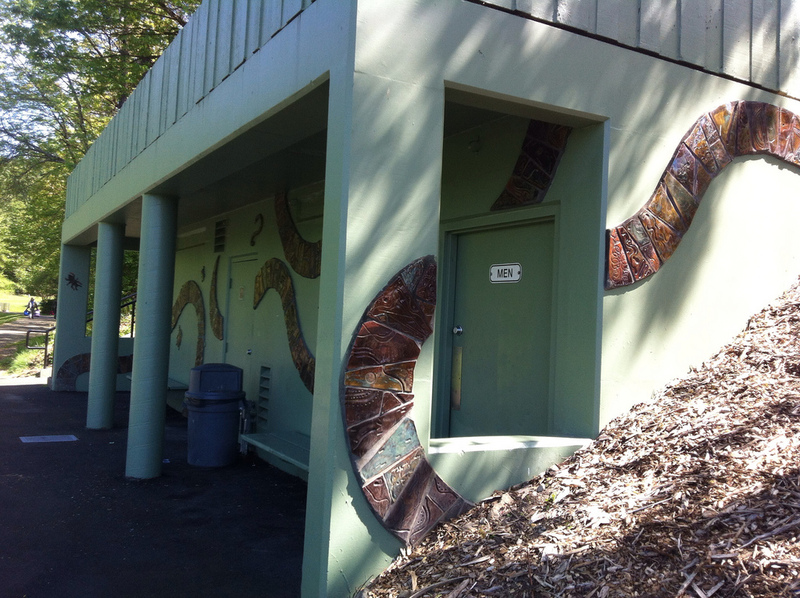 More about art in Auburn can be found here. I plan to go back when the weather turn nice (hopefully soon!) and see all the other pieces! This entry was posted in Art -- there is art here!, Kent, WA State - King County and tagged art, Auburn, Deborah Drllevich, downtown, Gear Ball, Greg Bartol, Jenny Ellsworth, outdoors, sculpture, Silverware Ostrich on March 5, 2017 by admin. Naked Pizza at 417 Ramsey Way (Kent Station), was a takeout stop for me after my dentist appointment today. It is part of a small chain that has 7 US locations (this one, 4 in Virgina, one in New Jersey and one in New Orleans, LA) and one location in Kenya. I really enjoyed the mason jar lighting system over the largest table in the restaurant. When I finally got home almost an hour later (I5 traffic is crazy!) the pizza had to be reheated, but it was very good. Their website tells me that the pizza is made with an abundance of good stuff. 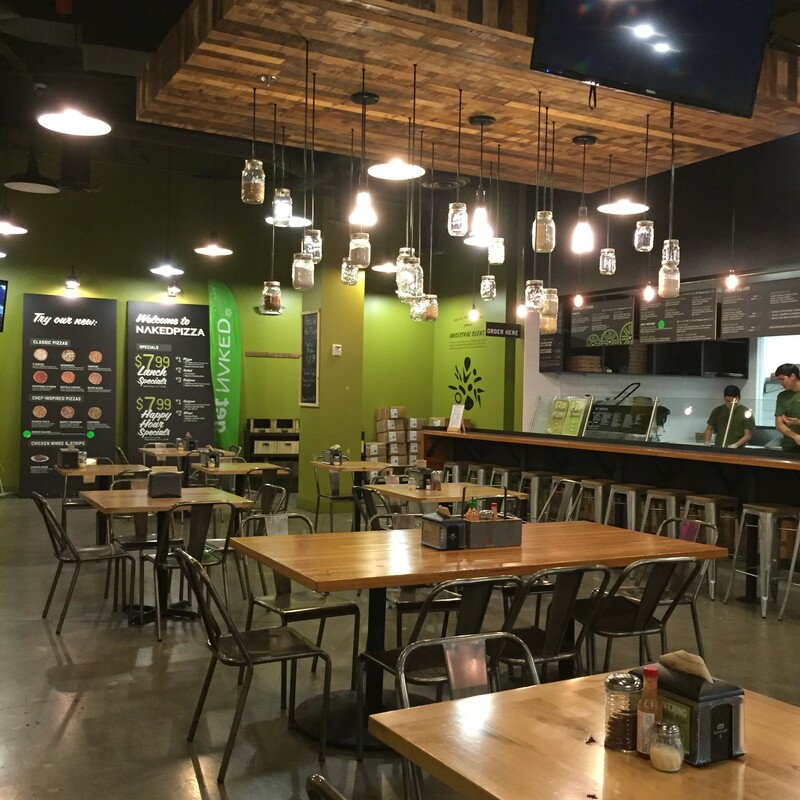 This entry was posted in Kent, Restaurants, Sit Down Establishments, Take Out, WA State - King County and tagged I5, Kent, Kent Station, lighting, mason jars, Naked Pizza, pizza on November 5, 2015 by admin. On Wednesday I was in Kent and stopped to enjoy the day at Mill Creek Earthworks Park at 742 East Titus, Kent, WA. It was a lovely day and there were baby ducks! The park had good and bad to it. It was designed by Bauhaus Master, Herbert Bayer. It is a very cool storm water detention system and designed to handle a 10,000 year flood. It looks like a place that hobbits would live in. The restrooms have delightful art on them. It is part of a restoration project. It connects to other Earthworks Project. Did I mention the baby ducks? You can see them crossing the trail on the photo above. The toilets in the women’s room don’t have doors and I really like doors. The trail was closed, so I didn’t try to go down it. There was a homemade cross on the site that said “the truth will come out about how you died”. Kind of creepy to me! So the good out ways the bad and I’d love to go visit again. 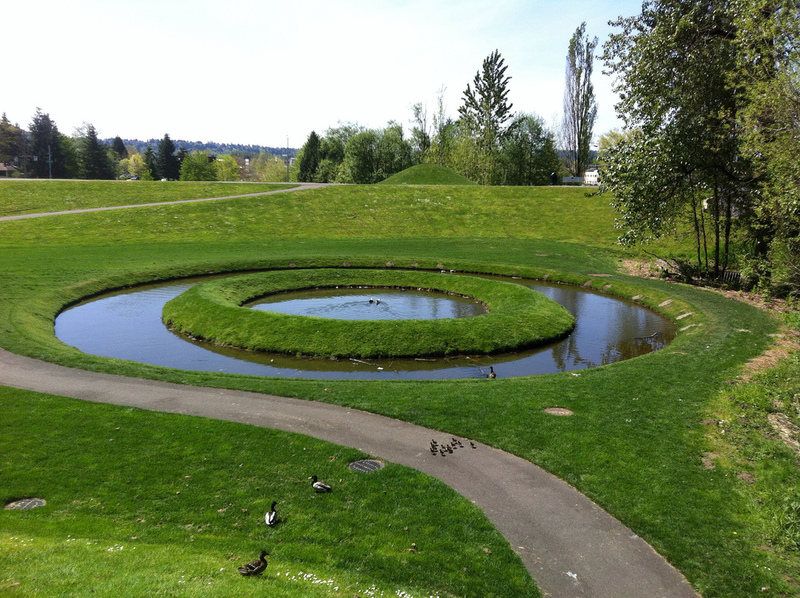 This entry was posted in Art -- there is art here!, Kent, Parks, WA State - King County and tagged art, baby, detention, ducklings, ducks, Earthwork, flod, Green River, Herbert Bayer, Kent, Mill Creek, Mill Creek Earthworks Park, Millcreek, restoration, restrooms, storm water on May 5, 2013 by admin. Kent Station reminds me of the shopping in Dallas. It is full of upper end stores and a perfectly maintained, self contained arranged like a small village. My place of the day was Christopher and Banks, woman’s clothing store. They were offering 40% off everything in the store and I also had a $10 off coupon. Seemed like a good time to go! 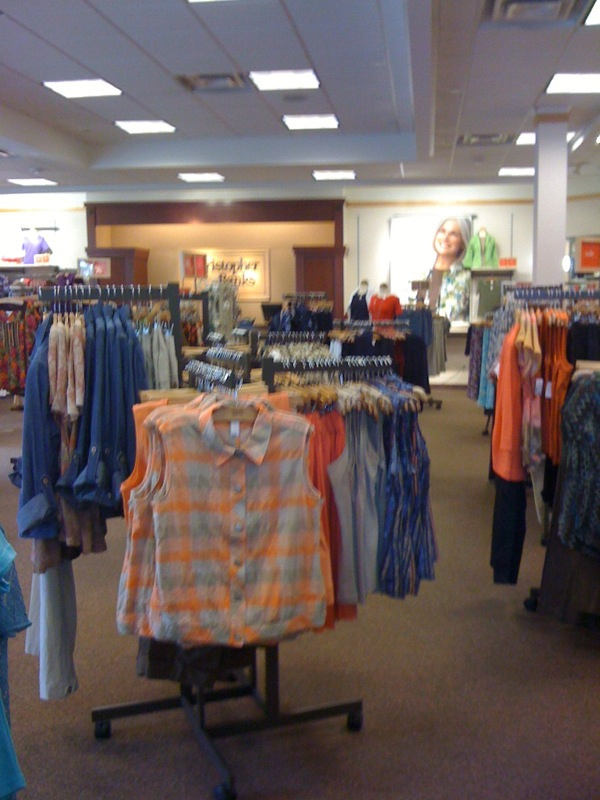 This entry was posted in Chain stores (there are a bunch of them), Kent, Stores and other places that sell you things, WA State - King County and tagged Christopher and Banks, Kent, Kent Station, sale, woman's clothing on May 30, 2011 by admin.